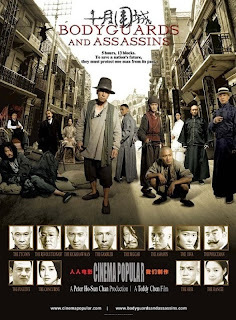 Bodyguards and Assassins or 十月围城 - Dark October in Chinesse, love it! You should go to the movie and watch this one! Don't miss it..
Its a story about a heroic act from a group of people protecting, Sun Yat Sen aka Sun Wen, one of China most honoured hero, when he came to Hongkong to meet the 17 districts delegation in October 1905. Sun Wen came to Hongkong to finalized their plan, changing China into a democratic country. That's why his arrival become a huge threat for the Qing Dinasty. Then, the Queen sent so many assassins to Hongkong with one aim, kill Sun Wen. The best part of the movie is the bodyguards! Bodyguards and Asssassins, you might thought that its about Sun Wen's bodyguards whose accompanied him to Hongkong, guarding and protecting him during the meeting. But, these bodyguards are not that kind of bodyguards. Hemm, I am not going to tell any further about the story. You better watch the movie then find it out by yourself, what kind of bodyguards are they? And, last but not least, the cast would amazes you!